One of the perks of majoring in marketing, that comes from being submerged in all the latest news and trends, is finding out about unique, cool products, and of course, prices, places, and promotions, too! Bryce heard about a thing called "Honey Toast" at a restaurant called Shokudo. Toast with honey on it, right? 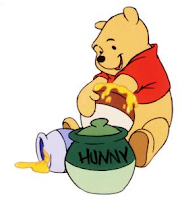 To me, it sounded like something Winnie the Pooh would eat for breakfast! One Saturday, I dragged Bryce to the mall. After a few hours he'd had enough shopping and demanded that we I stop shopping so we could eat. We considered eating at the [over-crowded] food court or any of the [uninteresting] restaurant chains inside the mall but nothing was floating our boat. That's when we remembered that Shokudo was right next to the mall! Our boat promptly floated right through the restaurant's front doors in a matter of minutes. We'd watched several surrounding tables order and enjoy Honey Toast and we were giddy to finally ask our server for the dessert menu so we could see what options we had to chose from. We went for the Oreo Cookies and Cream. Look how many options there are! So, what is honey toast? My guess, honey on toast, is technically right. It's so so so much better than that! About.com says: It's a thick slice buttered toast with honey and vanilla ice cream. The crunchy crust is as delicious as the soft inside. 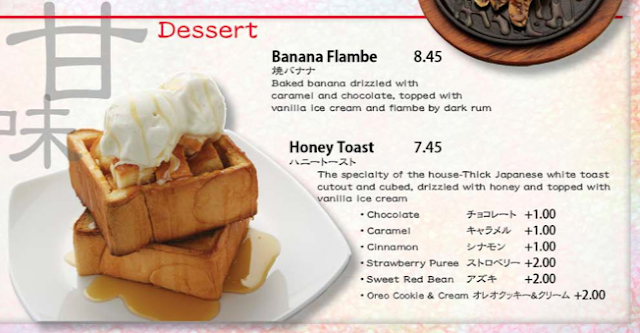 Honey butter toast is sometimes served as a dessert in Japanese restaurants or cafes. It starts with two perfectly square slices of bread, more like loaves of bread. The bread is toasted and the inside is cut into cubes, and graced with honey and butter. Since we got Cookies and Cream, we also had sweetened condensed milk, or something like it, on ours, making it even more insanely decadent! The top is piled high with ice cream, cookies, and chocolate syrup. Honey Toast is massive! When it arrived, I said "there's no way we'll finish that"! But... we did! I've never really seen, or eaten, anything like it before. The best combination is getting the cold, smooth ice cream with the warm, buttery, toasty bread together for a delightful hot/cold and sweet/salty bite! Shokudo, we will be back for more Honey Toast! Yes, it was giant! We ate the whole thing (except for the crust). That looks soooo good. I'm going to show Don these pics in hopes of convincing him to go there for dinner tonight! Awesome. It's kind of classy and we were under dressed, so wear something cute! And get the honey toast, DUH!